We have over 40 years experience in vehicle recovery arising from major breakdown, accident or theft. Our 24 Hour UK Control Centre deals with vehicle recovery throughout mainland Britain. We are the chosen provider for major Motoring Organisations, Police Authorities, Highways Agency, VOSA, Local Authorities, Insurance Companies, Franchise Dealerships, Body shops, the Motor trade, businesses of all sizes and for individuals too. Specialist vehicles are stationed throughout Southern England to ensure a swift response. Our network of approved suppliers ensure a rapid response and fast repatriation of vehicles anywhere within the UK. Modern total or partial lift vehicles with comfortable seating for up to 7 passengers - perfect for long journeys and large families. 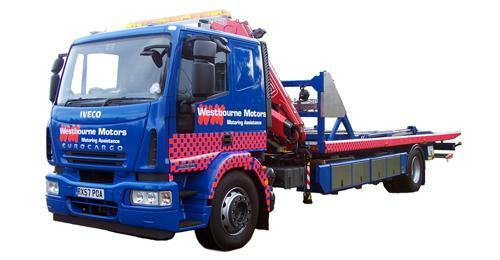 Extra low loader for vehicles with minimal ground clearance, customised vehicles, sports and racing cars. Specialist trucks available for long vehicles including mobile caravans, motor homes, trailers, limousines and boat trailers anytime and anywhere within the UK. Accident Units on 24 hr call to recover vehicles regardless of their condition. Four Wheel Drive support vehicles are on standby to assist at off road or remote locations. Collection and delivery of motor cars and mid -size and heavy commercial vehicles is our speciality. Multi car transporters to save you money by load sharing. Competitive prices for non urgent long distance transportation. Westbourne Motors is rigorously inspected every year, to internationally recognised standards and guarantees you, a safe, efficient and accredited service. The service extends to motorcycles, cars, vans and commercial vehicles please call or click for a quotation. We cater for individuals and fleet users.